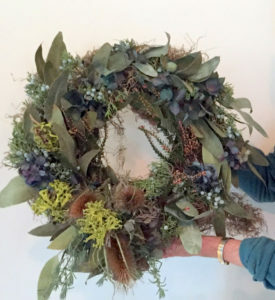 This is a version of a workshop that I learned and then taught in Hawaii, and have taught in Florida and in Oregon for a Master Gardener group. 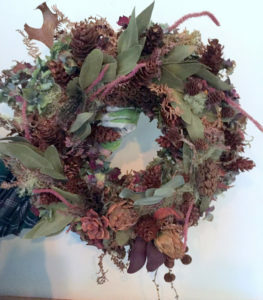 These are heirloom wreaths, made from dried materials that look the same year after year. 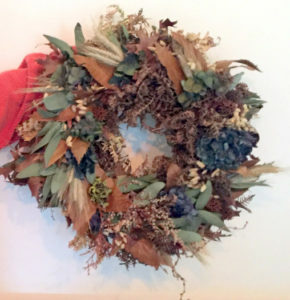 I collect materials all year and keep them dried in my garage, and then we recombine the textures, shapes, and colors into a 12 , 14, or 16 inch wreath base. They do need to be stored in a dry place, and are best used inside or in a very protected spot outside. Some students find them so attractive that they leave them hanging all year. 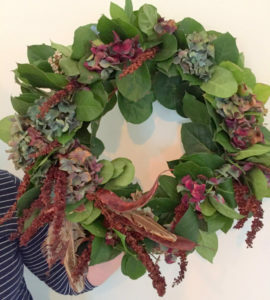 We can use a few green materials- like salal, as long as it will dry well when packed tight with other materials. 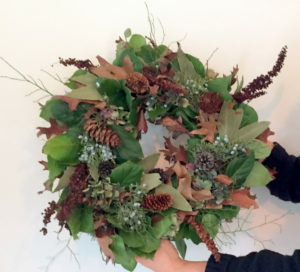 All materials are provided, although I encourage students to bring dried leaves, pods, and cones from their own garden. 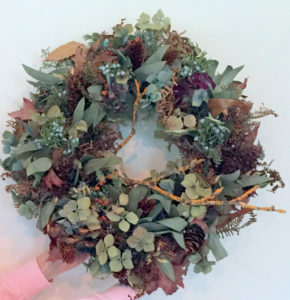 When done in this characteristic “Hawaiian style” they are very full wreaths, and may take 3-5 hours to complete, depending on the materials used. Some folks opt to also make swags and this is an option if time provides. Please bring lunch and a beverage. Call or email Heather to register:541-270-9697, fishprint@gmail.com.